A Double Wedding Ring is surprisingly versatile. What happens if you make the rings different sizes, and don’t join them? How about adding some other elements? Let’s play with modernizing an old favorite. Have fun and see what happens! And with a white or solid background, it can easily be a modern quilt. Pattern required for class. $10. Contains full sized templates and directions for 3 different finishing techniques. Gyleen was born in Philadelphia, PA but grew up in Taiwan and Japan. Those formative years in the Far East developed her love for simplistic artistry. She began needlework at the very young age of four and has since pursued artistic expression in drawing and quilt making. 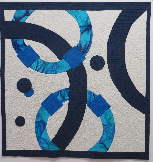 Her quilts blend color, pattern and texture to provide a contemporary essence to traditional quilting. Her strength as a quilter is demonstrated by the infusion of engineering tools and techniques to simplify visually complex quilts. The workshop she will be leading for us is based on her new technique which she calls “Butterfly Seams” and is all about simplifying a visually complex quilt. She obtained a Bachelor of Science degree in Chemical Engineering at Drexel University and opened Colourful Stitches in 1999. Her first subsidiary, FPI Publishing, was launched in 2005 with the publication of her first two books. Her second subsidiary, Tools by Gyleen, launched in 2010 with the Pineapple Tool. In 2011, she obtained her first Trademark for the Butterfly Seam. Gyleen has appeared on The Quilt Show and Lifetime TV promoting finishing antique quilts and the new spirit of traditional quilting. Gyleen has an active social media presence on three Facebook group pages and in the Forum of The Quilt Show’s website. Gyleen has an unusually fresh and very personable approach. It will be a delight to have her with us at Cotton Patch Quilters. One day is all it takes to make this 22” x 80” table or bed runner. You’ll love the butterfly seam technique that makes the piecing effortless. Sewing machine in working order, etc. Tools: Deb recommends bringing your favorite “big” ruler: i.e., 6” X 24” or 8.5” X 24.5” or 12” X 12” or whatever. Soloist: This is the feature fabric and like a soloist will make your quilt sing. However, too many causes disruption, be a wise and only select one. 22” x 18” is all you’ll need. Harmonizer: This is the voice that blends or goes between the soloist and the choir. You know the voice that has range. 22” x 18” will work. Choir: This is where you have the variety. These are the voices that are nice and even great but for sure they are not soloists. You will need (12) 3” x 40” strips. Background: Everybody needs a stage; a platform of sorts to showcase the act. One yard is perfect. Special instruments: Polygon and Polygon2 Tools. Gyleen’s pattern for “Star Struck” and/or the book “Polygon Affair” will be available at the workshop as well as the two Polygon Rulers/Templates. The Polygon Ruler is $14 and the Polygon2 Ruler is $20. The class pattern will be $8 or the Polygon Affair book is $25. General Notes: I (Gyleen) selected a bunch of stuff from a fairly narrow color palette. One fabric (background) needs to be at least a yard or better; or you need several that can be substituted for each other. Personally, I think this project lends itself to a variety of background fabrics.